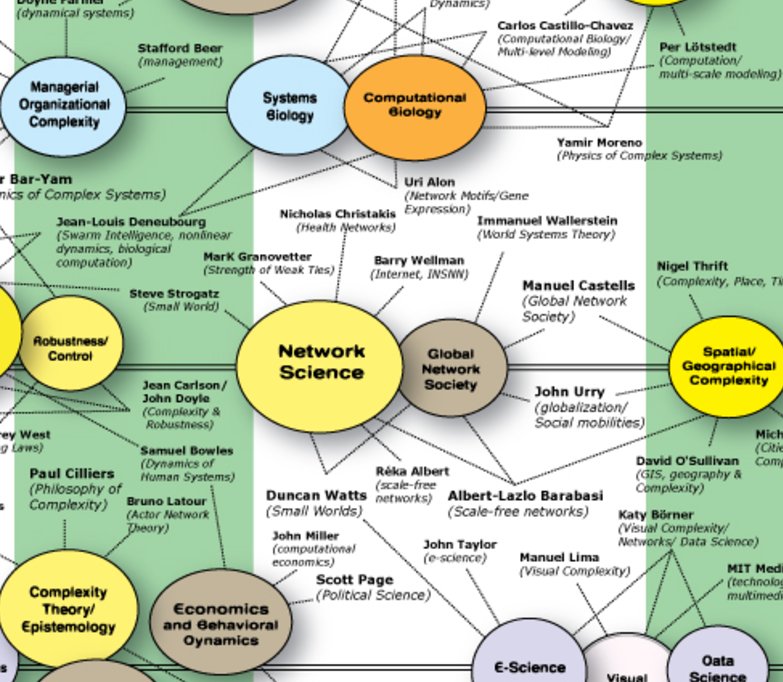 If you are as much as a complexity theory geek as I am becoming, you might appreciate this map by Brian Castellani that links to the founders of the various branches of complexity science. The map is described as “s a macroscopic, transdisciplinary introduction to the complexity sciences spanning 1940-2015. ” It is a fantastic resource because each of the founders of a branch of this science are represented by links to archives of their work. You could read for hours. Days even. Of course, this map has some heavy biases and it doesn’t point to the people that have done a tons of work heavy lifting these concepts at the margins of academia or in community. And so, like all maps, the map is not the territory. Bronagh Gallagher and I have been reading through various angles of complexity theory in an effort to explore the many paths that this branch of knowledge has taken. Using this map we can see how we have arrived at our current theory basis from which our practices have evolved. What I find useful is to see what other branches of the trees are represented and how they inform our practice and understanding of the “anthro-complexity” that David Snowden has introduced us to. We have been working most closely with the work of Snowden and Duncan Green in our work and lately have been musing about including Glenda Eoyang’s contributions as well as the practical methods of Liberating Structures. It’s all coming together into quite a nice little enquiry. Our programs on working in complexity in Vancouver and Glasgow will scratch the surface of the theory, enough to inform conversations about practice. But if you want to take the deep dive, the map is a fabulous starting point.